Chia seed benefits are well knows since the ancient times, therefore know-days it is food for modern lovers of healthy eating. 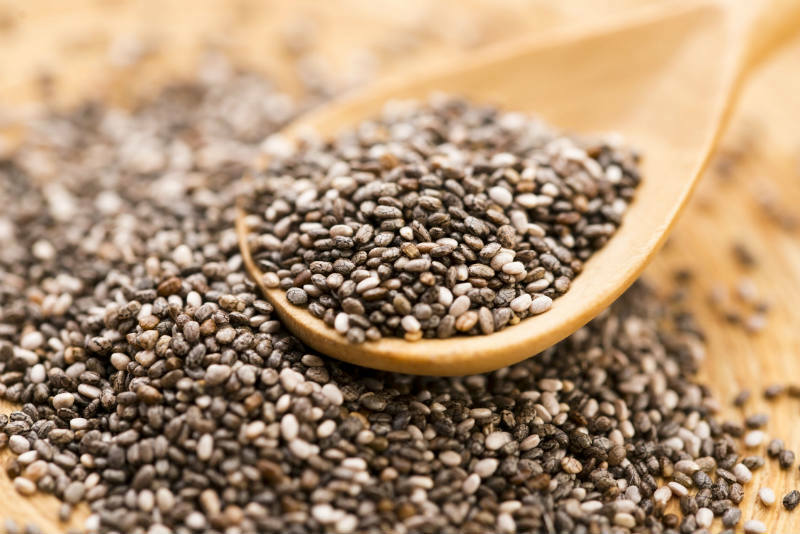 Chia seeds impart many health benefits, some of which include controlling diabetes, lowering cholesterol levels, improving the digestive system, boosting heart health, controlling hypertension, and they even contain anti-inflammatory properties. Chia seeds come from the chia plant, which is native to Mexico and Guatemala. The scientific names of the plant are Salvia hispanica and Salvia columbariae. They both belong to the mint family (Lamiaceae). They are very small and dark. This plant has been known to humans for a very long time. The chia plant had been cultivated by the Aztecs, Mayans, Incans and other tribes for a very long time. It was a staple food for them and historians considered it an important plant and food source for Native Americans. When it is translated from the Mayan language “chia” means “power”. Not surprisingly this seeds are called Indian traveling food, because they refuel with energy. According to Indians one spoon chia seed energizes the body for 24 hours. Chia seeds are an excellent source of protein that fills the body with easily absorbable amino acids. They are the richest plant source of omega-3 fatty acids and valuable linolenic acid, which the body cannot synthesize. Furthermore, chia seeds have more calcium than milk (5 times), more iron than spinach (3 times), 2 times more potassium than bananas, 2 times more protein than other grains, 2 times more antioxidants than blueberries. They are rich with the mineral boron, which helps the movement of calcium into the bones. High levels of antioxidants make them long lasting and easy to store. Regulates Blood Sugar – Rising blood sugar levels is one of the many major health concerns today. Chia seeds are one of the best foods for regulating blood sugar levels. Chia seeds help reduce insulin resistance in the body. They are a must-have if you want to keep diabetes at bay. Improves Digestion – The high dietary fiber content of chia seeds is good for regulating bowel movements and also helps to keep up overall gastrointestinal health. Chia seeds make you feel full for longer, thereby reducing the urge to overeat. Protects the Heart – Chia seeds are considered as heart-friendly food. The reason is that they are the richest source of omega-3 fatty acids in the vegetarian world. Omega-3 fatty acids are the good fats that protect the heart and prevent the onset of heart disease by reducing the levels of omega-6 fatty acids (bad cholesterol) and maintaining a stress-free cardiovascular system. Anti-inflammatory Properties – Chia seeds have high levels of alpha lenolenic acid, which can be easily converted into omega-3 fatty acids and act as an ideal inflammation controller. These fatty acids control inflammation in the joints and arteries. It is estimated that a daily intake of about 4 grams of alpha lenolenic acid is enough to prevent arthritis. Aids Weight Loss – They are helping to reduce appetite and for weight loss. Added to the dishes, they give a feeling of satiety, on the expense of calories and fat. They can be used in weight loss programs. The recommended daily intake: 1 tsp. Thanks to their strong hygroscopicity, chia seeds, absorb moisture, prolong hydration and retain electrolytes, especially during heavy exercises. Seed protein does not contain gluten. Therefore it is suitable for people with gluten sensitivity, and for all those who want to replace gluten seeds (wheat, barley, rye and oat). For pregnant and breastfeeding women, and for people with increased physical activity, they can help to speed recovery and building of new cells in the tissues. Chia seeds can be added to oatmeal or cereals, in salads, sauces, pastry, smoothies, cakes and all kinds of dishes of your choice. Typical of them is that they retain the flavor of the meals, and increase their nutritional value. How to Relieve Constipation in Babies?